How much will be covered under my current homeowners policy? Most homeowner policies allow for a small amount of automatic jewelry coverage, but it is typically not high enough to cover even a low end engagement ring. If your homeowner’s policy doesn’t cover it automatically, you should add some “Scheduled” personal property coverage. What is "Scheduled Personal Property Coverage?" This is usually an addition to your homeowner’s policy. 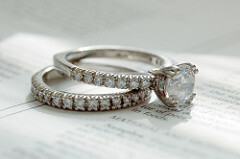 It enables you to ensure that your valuable ring you just got is covered for the proper amount. What is "Actual Cash Value" versus "Replacement Cost?" If you lose your ring, your insurance company will pay your claim typically in one of two ways. Actual cash value or replacement cost. Actual cash value pays what it would cost to replace the ring minus depreciation costs. They would take into account wear and tear and might pay a lower amount. Replacement cost pays what it would cost to buy the ring again. No guess work, but the premium is higher for this coverage. As you can see, there are many things to consider when considering jewelry insurance. If you would like a personal review of your jewelry insurance needs, don’t hesitate to call Mosaic Insurance at 928-458-7374.